Click here for more Derby photos. Click here for photos from the Oaks. Kentucky National Guard Pfc. 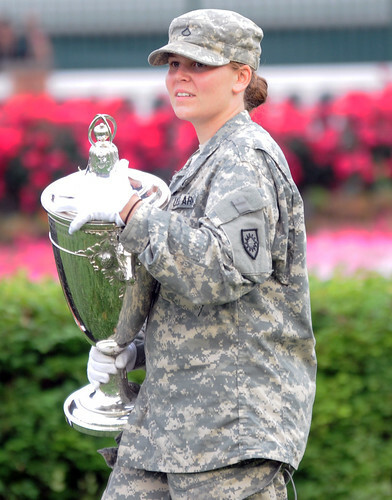 Kara Denise Bucklew, an MP with the 223rd Military Police Company stationed in Louisville, Ky., moves the winner’s trophy for the Kentucky Oaks race to the winner’s circle at Churchill Downs May 4, 2012. (Photo by: Spc. David Bolton, Public Affairs Specialist, 133rd Mobile Public Affairs Detachment, Kentucky Army National Guard). LOUISVILLE, Ky.— Louisville’s legendary Churchill Downs hosted the Kentucky Derby May 6 for the 138th time – but for 19-year-old Pfc. Kara Denise Bucklew, a Military Policeman assigned to the 223rd Military Police Company, this was her first Run for the Roses. Kentucky Army Guardsman Pfc. 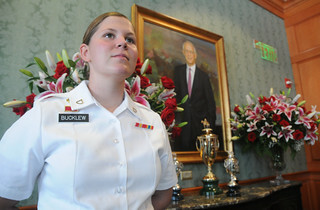 Kara Denise Bucklew, an MP with the 223rd Military Police Company, guards the winner’s trophy for the Kentucky Derby in the Director’s Room on millionaire row at Churchill Downs in Louisville, Ky. May 5, 2012. (Photo by: Spc. David Bolton, Public Affairs Specialist, 133rd Mobile Public Affairs Detachment, Kentucky Army National Guard). As an MP, Bucklew was selected and charged with guarding the Kentucky Oaks and Kentucky Derby trophies on Millionaires Row. Valued at $200,000, according to Ronnie Dreistadt, educator at the Kentucky Derby Museum, the trophies are awarded to the owners of the Derby winner after what is known as the fastest two minutes in sports. Bucklew was in the Winner’s Circle as Kentucky Gov. Steve Beshear presented the 18-karat trophy to the I’ll Have Another crew: J.Paul Reddam, owner, Doug O’Niell, trainer and Mario Gutierrez, jockey. “It was awesome, I felt really important,” said Bucklew. Coming from a military background where both her father and grandfather served in the U.S. Navy, Bucklew, a JROTC graduate, was influenced by the prospects of joining the armed forces. Bucklew said she is always enjoying new experiences in the National Guard.